2 - I have a medical release form that is for the children and youth only - how do I add that to the conditional formatting options for those that would be registering children in those age categories? the medical release form has a lot of verbage and asks for insurance information, allergies, medication list, etc. This form would only need to be completed once for each family, no matter how many children they are registering. This is actually very easy with jotform. To do that you should add Iframe Embed widget to your jotform in which you would add the link to the form you want to show inside - "medical release form". Once you have it in there, you can hide it until needed by utilizing conditions and if needed we would be happy to assist with that, so just let us know. 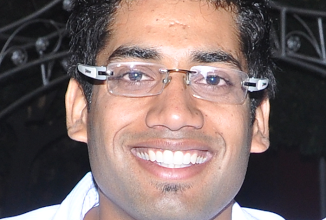 Thank you for your answers, however, I am not familiar with how to use Iframe Embed so I would appreciate further help. The way it works is by showing content from a different URL within itself. To show a different form, all we need then is to give it a link to our form that we want to have shown and set the conditions up. We would be happy to show you the steps needed and explain in greater depth if you can tell us which form (parent form) would you like to have the other form shown in as well as what is this other (child) form? That way we can give you the examples with your own forms and help you set it up. Here is the form that I want to come up if children or youth are checked on the first page of the registration form. Once I add in the URL, how do I set up the conditions for it? And once you do, just add the link above to it and set its width and height - that it will take on your jotform. Once we set it up it will be shown on our form. 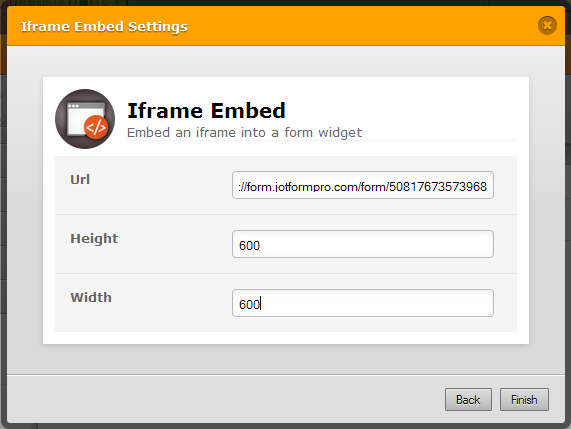 Once you do you should just connect the iframe embed through the conditions with the fields on your jotform. If I understood you correctly, you want to show this if either of the 2 options are selected and for that we will use OR rule, or as shown under this "ANY"
You can see more about OR and AND for the conditions rules here: How to Find The OR operator in conditions? The widget field(id1) should be set to iframe embed widget on your jotform. So, I've embedded the medical form using Iframe, however, when I go to add a condition the medical form is not showing on the list as an option. Do I have to somehow give it a title? I would only like to mention that since it is under the Form Collapse that is only shown for Youth option, this means that you need to click on Youth and Children (2nd-5th..) or it would not show the form, so I would change this in your condition to show when either of the two is selected instead - per my understanding of what you would like to achieve. I tested your form and had the same problems that I had when I set up the condition for the medical release form, which is why I thought I had the incorrect widget. -When I check the box to register children (2nd-5th grade), there are 2 forms that come up next - the children's registration form and the youth registration form. The youth form should not be coming up. 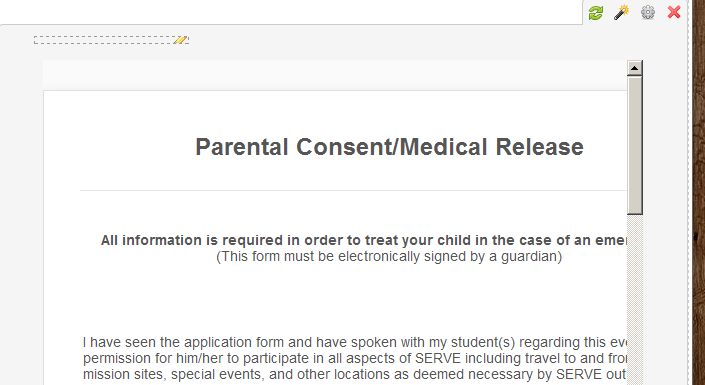 Also, when I hit submit, it submits the form without taking me to the medical form. -When I check the box to register youth, it takes me directly to the medical release form and skips the youth registration form. I believe this is because the "Youth" configurable list widget is under the "Children" collapse bar. I've cloned your form and edited it. Here's a sample of it: http://form.jotformpro.com/form/50881578009967?. See if that works as expected. You can also clone it to see my settings. 1. Add a collapse bar for "Children"
2. Add a collapse bar for "Youth"
4. Set up the condition to show the "Release" collapse bar if either "Children" or "Youth" has been checked or selected. Thank you for your help, everything is working fine and I was also able to add an additional embedded form. I have had one person use the registration form as my test person. I was able to get a report of all of the information except the last 2 embedded forms that were added - one is the medical release form that you helped me with, the other is a time away form that I added yesterday. How do I get those forms to show up on the report so that I can print them? I apologize, we should have mentioned this at the beginning. When you add a child form, you can submit it and capture its data, but you can not have several jotforms embedded since iframe embed widget does not capture their data into the parent form. In fact you will not see the option to show you this data at all. Based on everything mentioned here I believe that you should instead have the fields from each jotform shown in the same jotform to allow you to capture all of them at once. If you want, we can help you set it all like that - basically same as the jotform is set now, just without the iframe embed widget. You can actually merge the fields from one form to another, no need to recreate the fields. To do that you can use this app we have: http://apps.jotform.com/app/field_manager. That should let you combine the fields from your other forms. So, I did this and my fields are showing up twice. Do I need to go into Field Manager and delete the original widget? How do I do this so that my conditions are still working? No, you should actually go into the form itself and remove all iframes embed widgets and add then move the fields up to the place the iframe embed widget was placed at. I did this for you - at least for Youth and Release segments. was embedded right above the submit button and that the same was found under Youth segment, so I did not remove this one as it might need to be there or it might be a mistake. Do take a look and let us know how it looks and if you need any assistance with this. Thank you. That form should not be on there twice, however, I could not get it removed. Can you help with that? 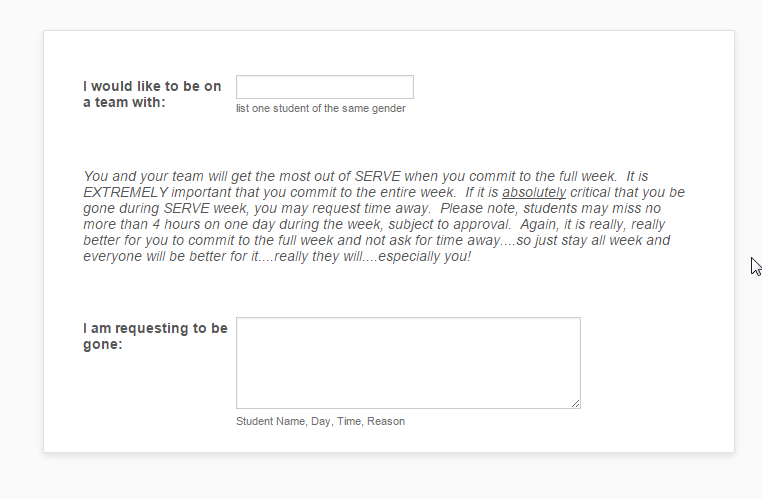 I cloned the form you are working on and I removed the last form that was embedded using iFrame. You can check the clone form here: http://form.jotformpro.com/form/50915140173952. You might need to manually add the fields shown in the screenshot below by using plain text fields and text boxes in your main form. The form seems to be working great! 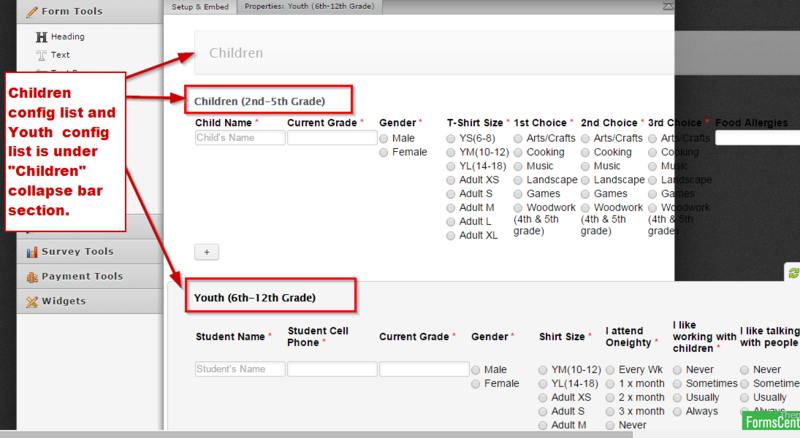 I do have one more question.....When registering multiple children in the same age category (like youth for example), parents are having trouble noticing the plus sign at the bottom left of each age group's form. How do I either change that plus sign to say 'register another' or add a text box next to the plus sign that says 'click to register another'?